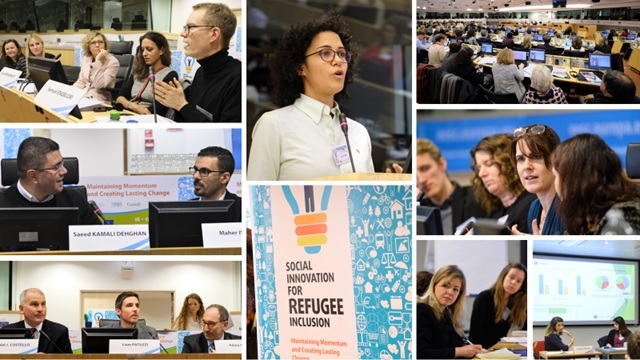 Following up on the Social Innovation for Refugee Inclusion seminar that took place in September 2016, MPI Europe, the United States Mission to the European Union, the Mission of Canada to the European Union, and the European Economic and Social Committee hosted a two-day event in 2017 that examined how successful new approaches to support the social and economic inclusion of refugees and asylum seekers can grow beyond pockets of innovation and inspire structural change. This conference focused, in particular, on newcomers’ integration in the labour market and the role of the private sector in fostering their employment and advancement. Following the arrival of large numbers of migrants and asylum seekers from 2015 onwards, many non-traditional actors—from tech start-ups to social enterprises—pioneered innovative ways to foster the integration of newcomers. In the context of this experimentation, business has also played a fundamental role, with companies on both sides of the Atlantic leveraging their potential as employers, donors, and partners in innovative alliances. The ambition of social innovation goes well beyond developing creative and interesting pilot solutions: it strives for a large-scale and long-term impact. Therefore, this conference aimed to discuss common challenges young initiatives encounter on their path to maturity—such as accessing funding, defining objectives and measuring impact, finding the right partners, and adapting to shifting political priorities—and to identify how to best tackle them. The event convened a diverse group of public officials, business leaders, service designers, social entrepreneurs, civil society organisations, and refugee initiatives from Europe, the United States, and Canada.